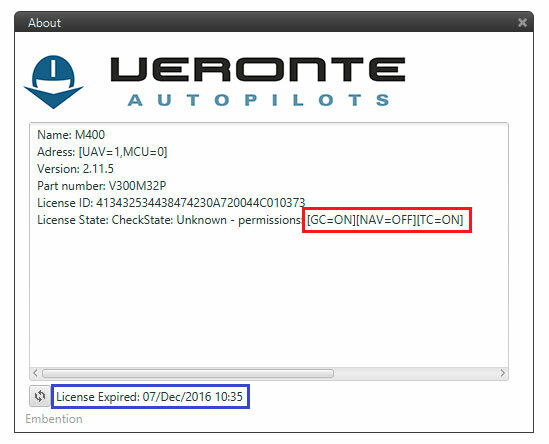 To access the License you have to open setup, then select Veronte and click on . In this tab you can check you License of your Veronte. You will have a different License Id for each Veronte (so, License Id Veronte Air is different from License Id Veronte GND). 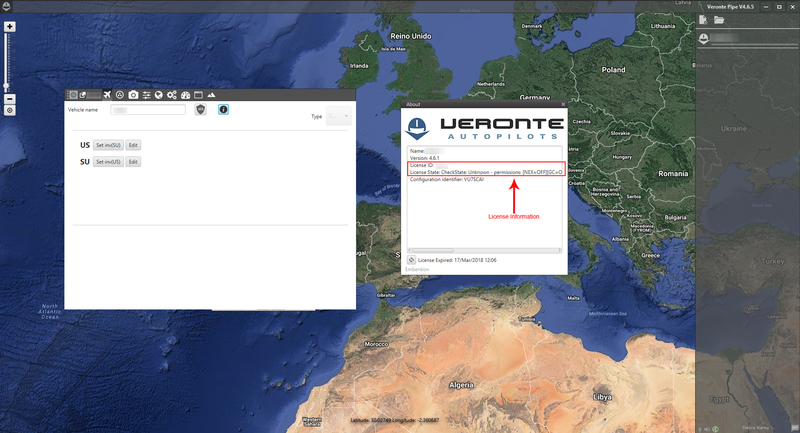 To renovate Veronte License, you must connect Veronte to Internet biweekly. The license state shows the possible action for the selected autopilot (ON=Active, OFF=Not Active). The Ground Autopilot license state for a normal configuration is ON:OFF:ON. The Air state is ON:ON:ON. The safe mode is used to avoid malfunctioning when the autopilot is trying to charge a corrupt file. When Veronte is trying to charge a configuration file in its SD card and there is some problem, the safe mode avoids that the autopilot tries to charge the corrupt file again and again entering then in a loop that would not allow communicating with it. Instead of that, the system charges a default configuration stored in its flash memory and enters in what is called the safe mode, allowing the operator to change the configuration and send it again to Veronte. It is also possible to force the enter in the safe mode by turning the autopilot off and on quickly. Safe mode displays the following window. It is possible to Change setup and select the configuration file which will be loaded on the autopilot. When a file is selected, a new window will be displayed in Veronte Pipe showing the version and identification of the configuration file and the autopilot where the file is going to be loaded. With this tool, the configuration file is loaded directly on the autopilot. Now Pipe is only a tool to load the file from the computer to the autopilot and the configuration parameters will not be shown in the software window before being loaded on the autopilot. The other option available allow the user update the Veronte Unit, this is explained in Update Onboard Software.